In Ladakh there is a local saying that “You can come to Ladakh on your own wish but you cannot get out of Ladakh without mother nature’s wish…” 🙂 … It was 7 AM flight and as I woke up in the morning and looked outside, the eyes were completely lit up seeing a white blanket all over the place outside window and it was still heavily snowing … Forgetting everything, I was immediately outside the room for some white pictures. Himanshu came out soon too to witness the pure whiteness around. It appeared no less than a wonderland and this was it, it couldn’t have ended better than this. Soon , a call came from Rigzin that he will be there in 15 minutes and we quickly packed up remaining things and got read to take off the flight back home. 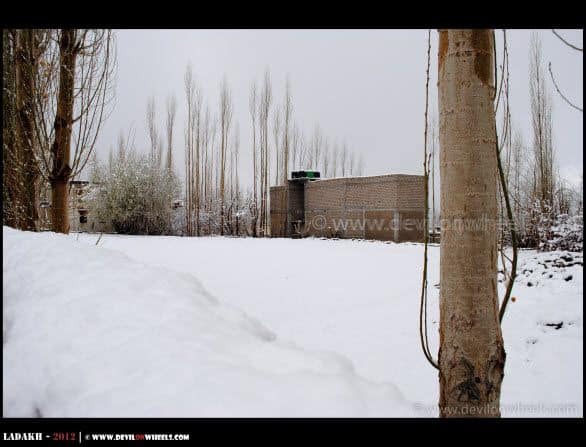 As we drove towards airport from the guest house, we were overjoyed to see whiteness all around the place. I always wanted to witness something like this but could never got a chance but this was it… With so many lovely experiences it could have never gone better and I felt very lucky to had been over such a trip and so were my travel mates, Himanshu and Tejas. We reached airport, hugged Rigzin, thanked him for all the lovely time we spent together his courage to make us see some of the most treacherous routes of Ladakh. 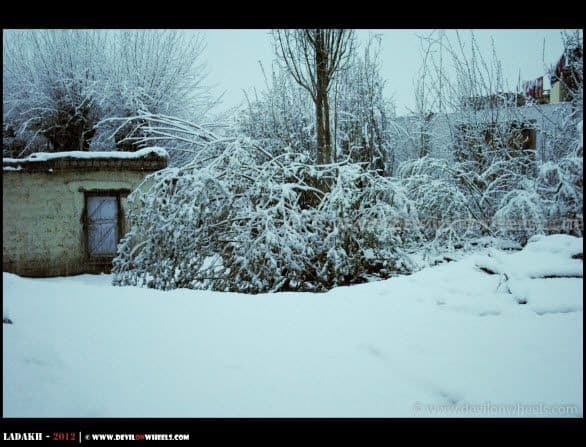 As we went in there were sure announcements of delay in flights because it was still snowing heaving. Half and hour past and an announcement for Jet Airways Cancellation 😯 but thank god ours GoAir was still delayed for 9 AM. Then, another announcement after half an hour that GoAir flight is also cancelled 😥 … And yes, I was trapped again in Ladakh but this time I didn’t fear at all 🙂 … The scenes outside were overwhelming but with sheepish smile I called up my family to give them the news and they inquired everything as they never wanted to be in a situation of 2010 but I consoled them that everything is fine it is just bad weather due to which flights got cancelled. After giving our names to the airlines, so as to ensure we get some call if possible for arrangements in other flights either today or tomorrow, we went outside and rang up Rigzin explaining him the drama and requested him to take us back to hotel. Excitement was such, instead of resting a bit out we went to grab this opportunity of clicking the amazing Leh whiteout pictures. Now, we called up Rigzin again, troubled him again and he helped us get some other room this time at Hotel Shaynam which is taken care by one of his relative only who is equally as helpful as Rigzin. By that time it was 2 PM as the 3 Hr long drama had finally ended. There was nothing to do, so we went to bed and slept for couple of hours. About 6 PM we came downstairs to explore the market, walk around there and it was pretty cold as it started snowing again!! Some more shopping for my kiddo, wifey and mom to compensate the unforeseen delay ;)… Finally, back to hotel to sleep out the extremely cold night. We were loving every bit of it. Aahh… After such a long period almost 9 days that we woke up late in the morning, about 9.00 AM 😀 … After all there was nothing to do there, we slowly got ready to go out and have something to eat. 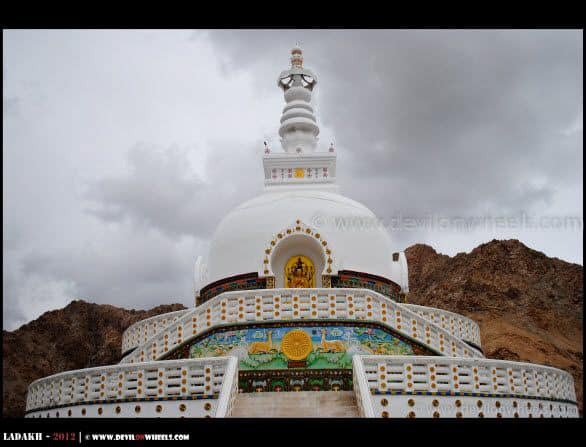 Our focus was to stroll to Shanti Stupa today and get the year 2012 – 13 Leh – Ladakh Taxi Union Rate List, which finally I published here. There was no other option that to proceed to Lamayuru restaurant and have something to eat, mainly sandwiches and some scrambled egg. Satisfying our tummies we went for the long walk all the way upto Shanti Stupa. It took a while to reach there as we were just following the roads leading in that direction rather asking for the directions. Changspa road was deserted at that time, thanks to the off season and only one of two restaurant were open there. 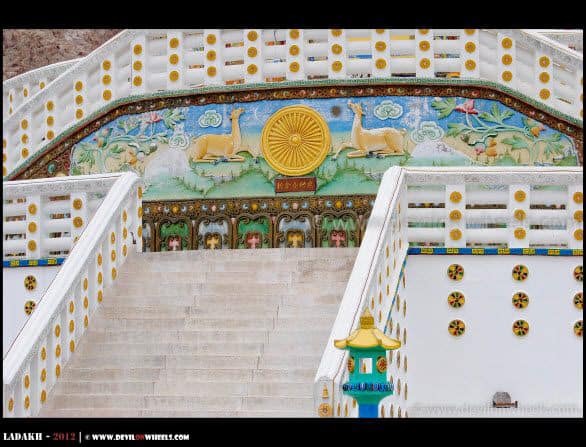 We scaled the stairs all the way upto Shanti Stupa, of course with numerous breathing breaks 😀 … It was an awesome sight to watch and in off season sometimes the place becomes all yours. 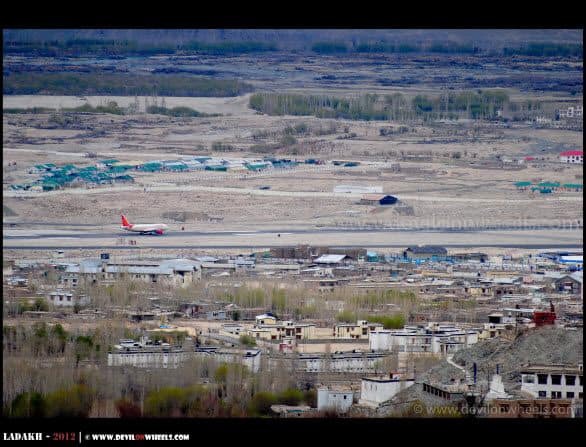 We shot some pictures of Aeroplanes flying out of Leh – Ladakh and then went back to the hotel to have another round of sleep. As we woke up at night the hotel was almost full as Srinagar – Leh Highway had also opened and lot of tourist came by that route, lucky they were. 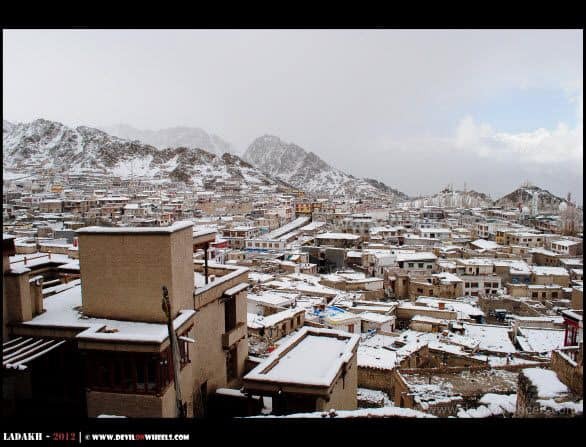 It was snowing out in Leh and we decided to have a cold walk out in the market to buy few more things for our family. It was so relaxing that I can’t even think and suddenly the adventurous holiday appeared to have a romantic ending. By dark, we went to Hotel and shared few discussions with lively Rinchen who meanwhile ordered some food to be cooked for us as well in the hotel kitchen because we did not want to go out this time. It was a light dinner with yellow dal and rice and we went to sleep in the cold night praying that flight would fly next morning. Finally, next morning, Day 11, we got the boarding pass after all the formalities not before a jerk checked in my baggage in his name and there was all sough of drama. Finally, I managed to identify my luggage in the final area with support staff and they did rest of the process and finally handed me my boarding pass. That idiot told me that he had 20 passengers with him and though ,y bag belonged to them only when security checks were being done. Wow, at last, we were in the flight which took about 90 minutes to land us in Delhi where I met my parents, kiddo and wifey before rushing to the office to join it. I have planned to visit Leh from 26 Jan to 31 Jan 2017. Me 50 and my wife 46 along with our son 20 have booked tickets. Please suggest the itenry and best usage of these days to have maximum fun. Also tell the precautions and necessary things to carry for health care. Hi, I m planning to visit manali and leh in june. 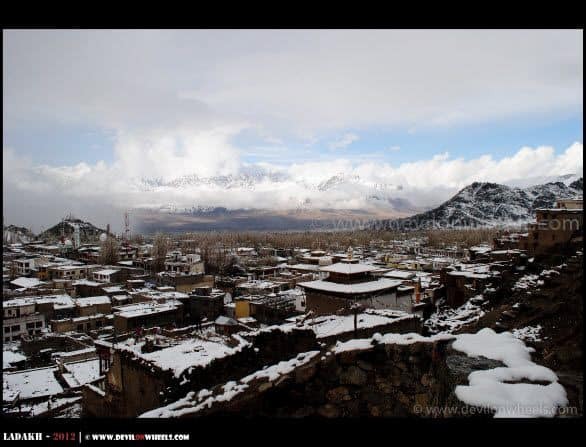 3 nights in manali 8th to 11th and 6 nights in leh 12th to 17th. 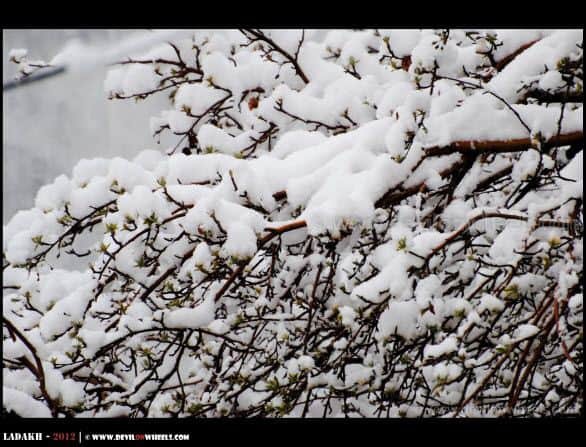 I wish to see snow, try skiing and other adventure sports. Is it a good time? Are the days sufficient? 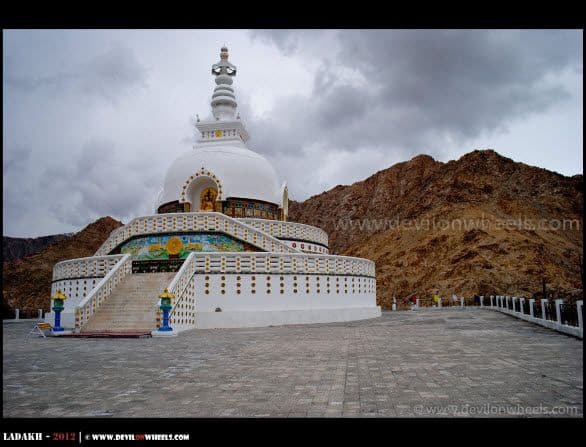 Hello – We want to plan a trip to Ladakh this year along with our children. 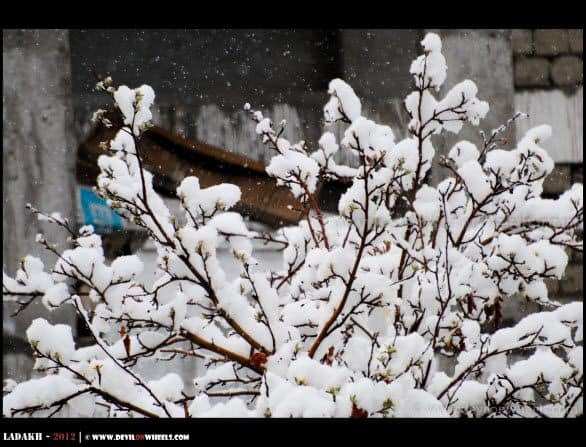 What may be the ideal month, when we can have the best of Leh and a chance of seeing snow? Any suggestions on where we can stay (best hotels). We may plan a 6 nights trip. 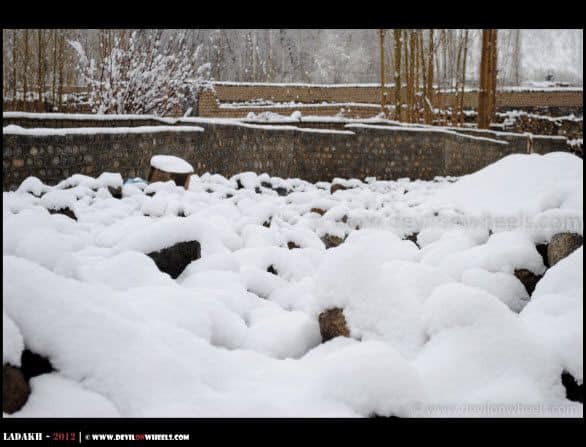 Shankar, in case you want to see snow as well then better make it in June else if you are not much keen on snow then best is to make it in September. 6 nights trip is less for Ladakh. Also, you need to fly in and out of Leh in that case. Oopps!, didnt mention the month. Its April. 1. Would there be sonw in Leh city as well? 2. 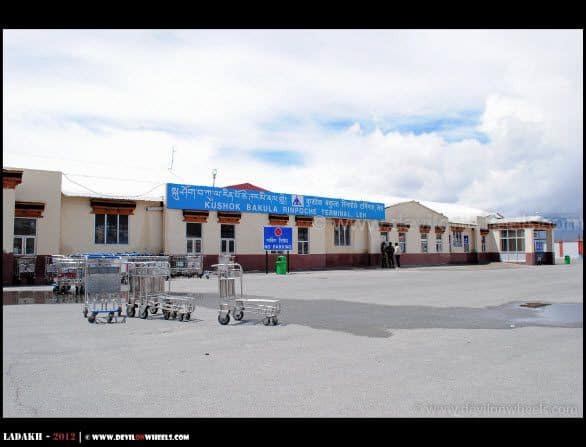 Would the food joints and shops be open during that time in Leh city? 3. Would bikes on hire be available to cover a day trip to Lamayuru? 4. Would ample hotels and guest houses be open in April? 5. Would camping in Pangong start by Apr 15th? Based on the weather, would it be safe to stay overnight there? Does the lake looks equally beautiful when semi-frozen? If its risky, is it worth taking chance. Please find my answers below. But, I will suggest that you go through the travel tale above as it is from April only. 1. 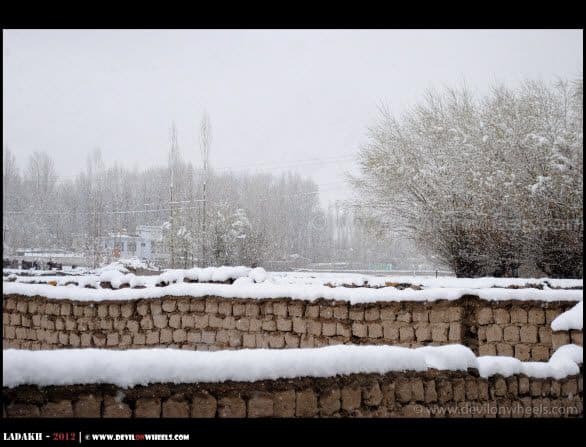 Snow will be in Leh only if it snowfall on a day, else no. 2. Not completely but to some extent only. 3. Yes, bikes will be available for rent during that time. 4. Not ample, but many will be available. We are planning for a week trip starting 2nd may as this is the only time when we all friends have got time and would be together. Is this a good idea to go or should we drop the plan ? Ajitesh, well brother I would suggest that since you just have this time, then better to take flight from Delhi to Leh and come back towards Srinagar while coming back from Leh. 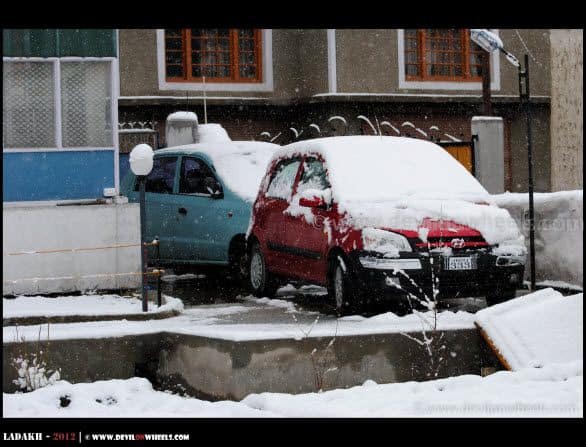 There are 50:50 chances only that Srinagar – Leh Highway will be open in that week. In case it is open, you cancel the flights and take road journey else carry one with air journey. I am planning a trip by 21st April and will be taking a flight from Delhi and back on 26th April. 1. What is the temperature at that time. 2. Is there options for trekking, camping e.tc. 3. Is there any adventure activity we can try? 4. Is nights good or we should extend our trip. 1. 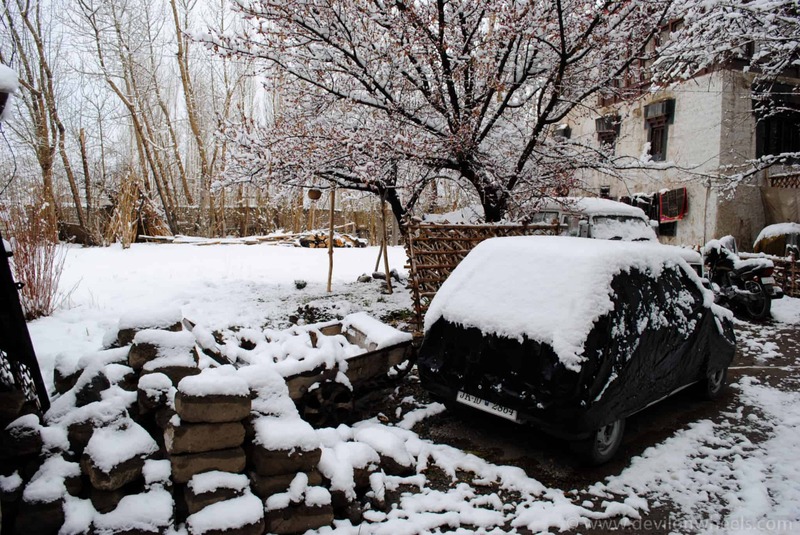 April is usually quite cold in Ladakh with night tempratures going below zero deg Celsius and days in sunshine are fine, around 10-12. In shade, with cold breeze, it will feel much more cold. 2. 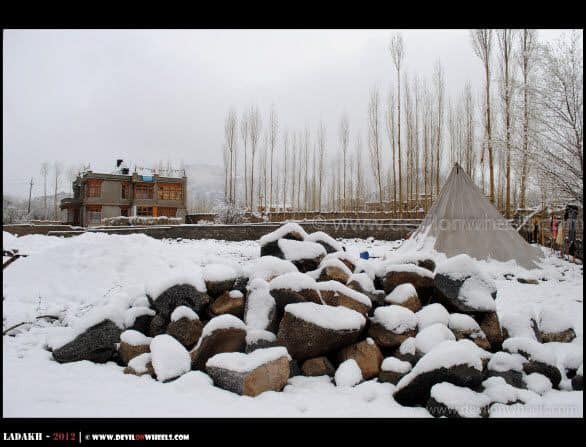 There can be options of camping which can be arranged BUT can you brave the cold during that period? 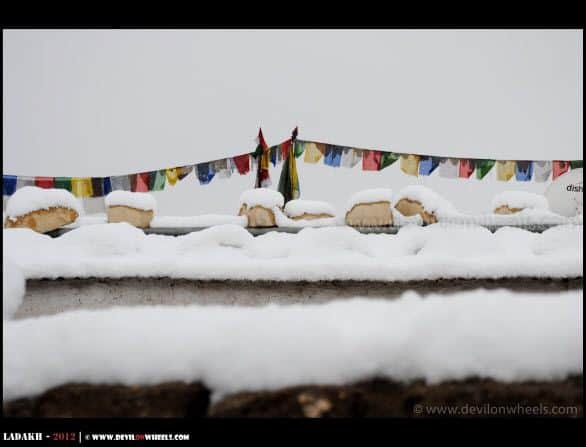 Specially outside of Leh it will be around -10, at places like Pangong Tso and Tso Moriri. Frankly telling you, no one does unless you are into extreme adventure. 3. Again braving the cold if possible for you, you can check rafting near Leh at Nimmu. 4. I personally feel that you should make this trip in June if you really want to enjoy. Even the lakes are frozen, may be partially, at that time of the year and very less options of stay. There simply cannot be a more detailed description written with envious enthusiasm and spirit as of yours.Thanks a lot Dheeraj for helping us in so many ways , we have finally decided to go in April, irrespective of the weather conditions ,because it’s once in a lifetime opportunity and besides ,I have not experienced snowfall yet ,so hoping that I might get a chance to enjoy it. Perhaps you should also mention your NEFT account details and people will start paying you out of goodwill for the immense help provided from your side. Great, Gaurav !! Best wishes for the trip and feel free to drop in any queries or doubts you have. 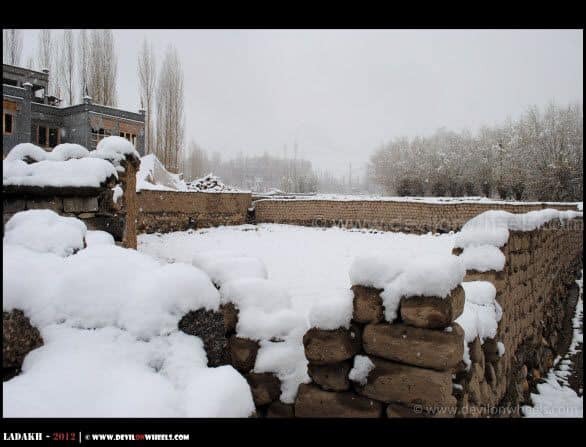 I will wish that you get to see lot of snowfall up there in Ladakh. i thoroughly enjoyed reading the entire ladakh journey, and i must say that you have captured some fantabulous scenes, awesome clicks :). i have personally traveled the kaza-kunzum pass-manali route and find a lot of similarities in the terrain. 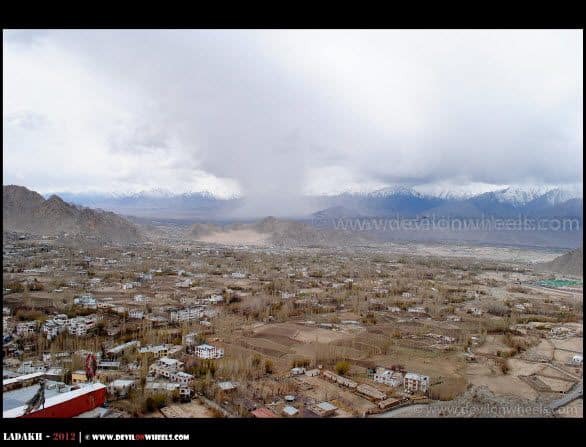 i am planning a trip for ladakh for the first week of may this year. will i be lucky to find all the passes open, specifically the one that leads to pangong lake and i will be travelling with my family so will the direct route from tso moriri to pangong via chushul cause any problems. Thanks alot. Passes within Ladakh are kept open all round the year, so you will find them open. You will not get permits for Chusul route now as since last year DC office has stopped issuing permits and this year as well orders are pretty strict for not issuing any permits to that place. Ayushee, no by that time of the year only Passes might have some snow leftovers, rest very far away peaks would be Snow Cladded. 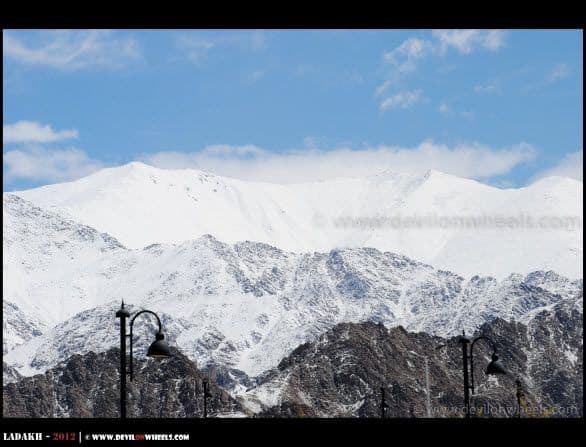 You might see some snow on the way to Leh or back to Manali from Leh at Baralacha La pass. 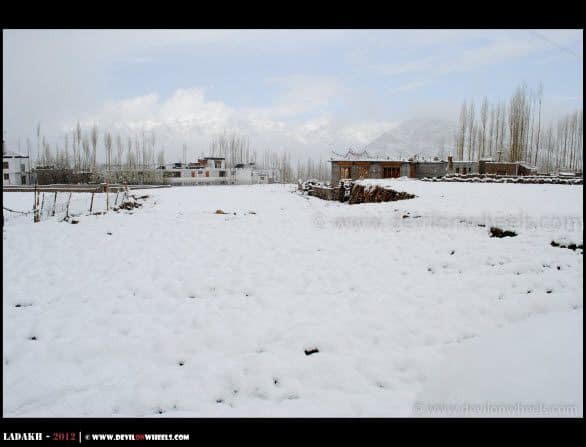 I WANT TO GO J&K SRINAGAR TO MALALI VIA LEH BY ROAD DOJ IS 4TH JUN 2013 IS IT POSSIBLE? Highly likely, it is possible because by first week of June Manali – Leh does get open but a bit unstable for closure for intial few weeks of its opening. 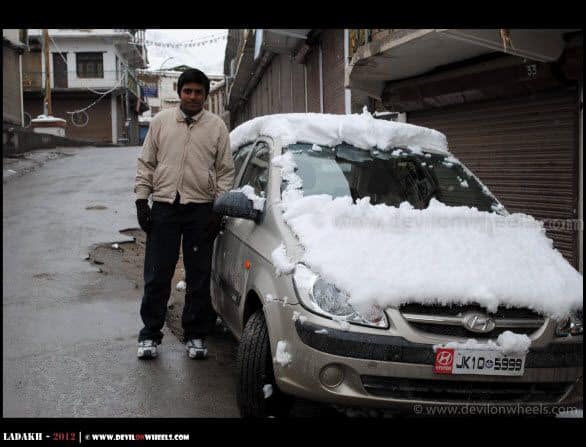 Day 7th July-13 | Jammu– Srinagar NH-44 (297 Kms- Fuel cost+ Lodging + Food)— Rs 2000. Day 8th July-13 | Srinagar – Kargil NH-1D (205 Kms- Fuel Cost + Lodging+ Food)— Rs-2000. 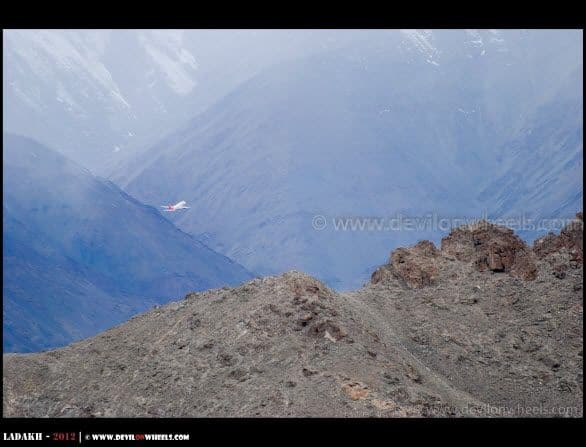 Day 9th July-13 | Kargil – Lamayuru – Leh (235 Kms- Fuel Cost + Lodging+ Food)— Rs-2000. Day 10Th July-13 | Leh Local Sightseeing + Inner Line Permits (Lodging+ Food+ ILP)- Rs-1500. 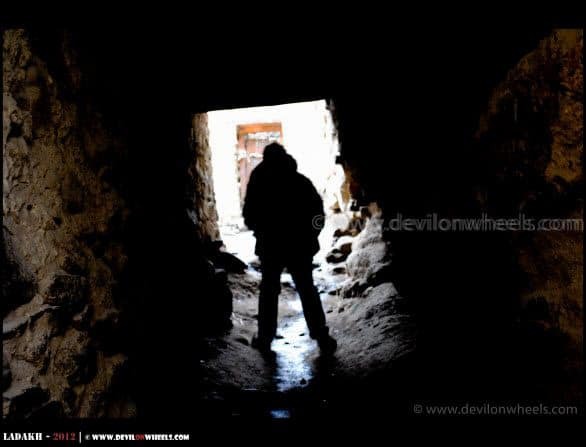 Day 12Th July-13 | Hunder/Diskit – Sumur – Panamik – Sumur – Khardung La – Leh ————-Rs 1500 ( Lodging+ Food). Day 14-July-12 | Pang Gong Tso – Mahe Bridge – Lake Tso Moriri – Stay at Karzok ——————————————————— Rs 2000 ( 120 Kms Lodging+ Food+ Fuel). Day 15th July-13 | Tso Moriri – Tso Kar – Moore Plains (Manali – Leh Highway) – Pang – Sarchu —————————————————Rs 2500 ( 200 kms Lodging+ Food+ Fuel). 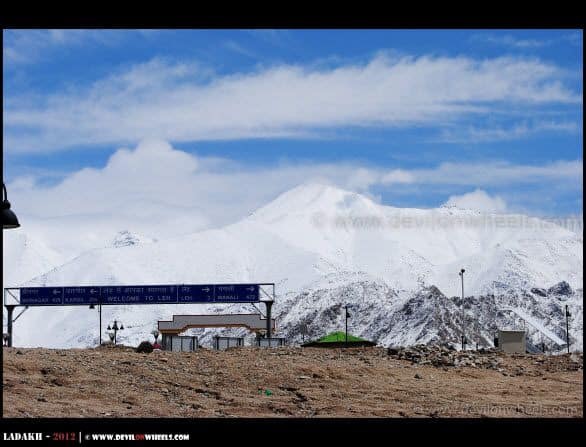 Day 16th-17th July-13 | Sarchu – Manali ———————————————————————————————————————————Rs 3500 (220 kms Lodging+ Food+ Fuel). 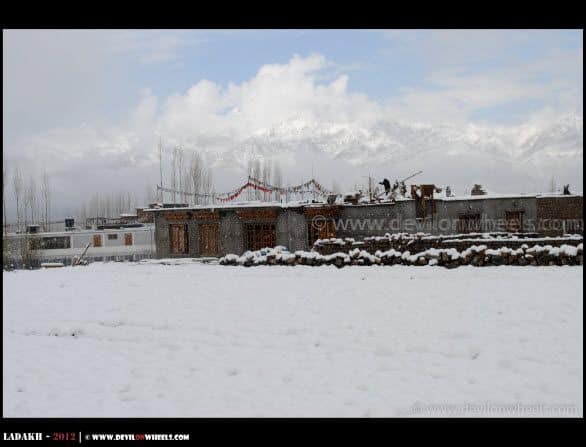 Day 18th July-13 | Manali – Chandigarh—Ambala Cant————————————————————————————————————————————Rs 3500( 340 kms Lodging+ Food+ Fuel). Day 19th July-13 –Ambala to Kolkata.—by Kolkata Amritsar super fast train. Reach kolkata on 20-July-13. Plan looks fine to me except Day 14 when you wish to attempt Pangong Tso to Tso Moriri. It is highly unlikely that in season time you will get the permit for that route. Plus you will need to carry fuel for about 900 KMs in that case even if you get through the permits. Plus it will be a very very very hectic day, almost a ride of about 14+ Hrs on tough/rough roads. I will suggest add one more day. 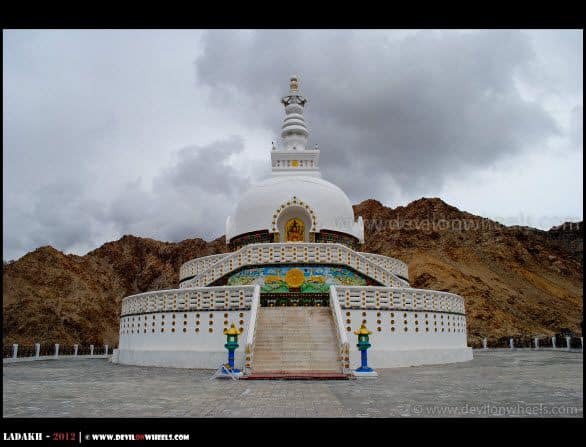 Make a day trip to Pangong Tso on Day 13th and then visit Tso Moriri on 14th with fuel for about 550 KMs and exit from there on Day 15th towards Sarchu. In June,2013 I want to cover the following( plan taken from your site):: Suggest if these possible in 1st week of june???? Sorry for the delayed reply. Return to Srinagar or Sonamarg from Gulmarg because Gulmarg to Kargil will be a bit long. Otherwise, you have crafted a perfect itinerary 😀 … Please go ahead with it. Hi Dheeraj!! How was your trip. Trip was amazing, just uploaded the first few set of pictures on FB page of blog in Zanskar – 2012 album. We had a great time over there along with some hiccups too. But, overall a very nice experience. 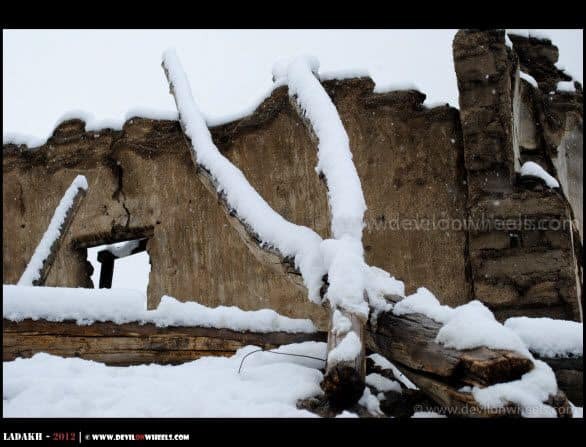 Lovely images… love those snow covered landscapes! Thanks alot buddy, glad you liked the pictures!! The place itself is quite astonishing. I missed this whiteout moment. It was just 3 wks since I left Leh. What a nice city!